Your pond or pool should be visible from your house, but not so near that wildlife will be frightened away. 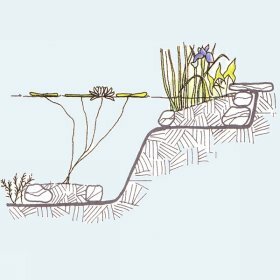 If the ground slopes, choose a lower corner in the garden: your pond will appear more natural here, as water naturally collects at lower level. A pool needs to be located away from any fruit trees or plants which may be treated with chemicals. An open, sunny position provides the best conditions to grow most aquatic plants. Don't site your pool in a frost pocket or an exposed spot. This will likely restrict the plants you can grow in it and may mean that the pool requires protection through the winter. Only add fish if the pond is at least 80cm deep. Examine the water conditions in hot weather because the fish will suffer if the temperature gets more than 25 degrees C.
If you need to lower the temperature plus top up the pool, add tap water which has been left to settle and warm up for a day. A water feature on the terrace If you do not have room for a pond, take a tip and improvise. 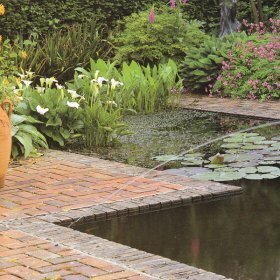 Make use of a large basin, stone trough or half-barrel, or frost-proof pots. Plug up drainage holes in pots with a silicone sealant and paint the inside of the pot with waterproofing paint. To prepare a half-barrel, fill it a number of days before you want to plant it up so that the timber swells and will become fully impermeable. 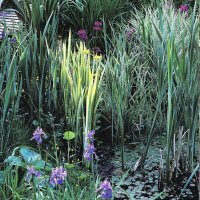 Pick out water plants that like warmth, as such a small volume of water will heat up quickly. Try a miniature variety of water lily, that will prosper in less than 40cm of water. Add to it a heat-loving floating plant, for example a water hyacinth, and give the arrangement some height with a clump of plumed foliage, such as Typha. minima, an attractive reed. Remember to incorporate a plant that can generate oxygen under water, like Myriophyllum aquaticum. In October you will need to bring your water hyacinth into shelter - a conservatory or heated greenhouse - for the winter, although other hardy species can be left in the water. 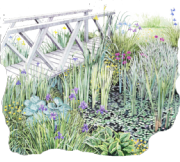 Water plants need sunlight make sure that you site your pond where it will get at least five hours of light a day - if possible, the morning sun. Position your pool away from overhanging trees, which throw shade over the water. If you don't you will have to collect dead leaves and control roots that could pierce the pond's liner. Provide o power point plan ahead in case you want to install a pump to circulate the water and prevent stagnation. You can also light your pond at night and make it a feature of any evening parties. 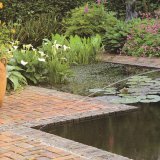 Start in warm weather April to July is the best time to create your pond. 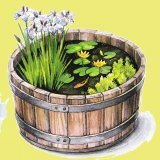 The water will warm up quickly and create the perfect environment for your first water plants. Water attracts children like a magnet, and it is important not to forget a child can drown in as little as 10 cm of water. Shield small pools (under l gal) by means of wire netting or even a rigid grill - the vegetation will soon hide most of it. Encompass bigger water features with a metre-high fence with a gate that should always be kept locked. Disguise the fence by means of honeysuckle, ivy or clematis. Steer clear of steep banks, which make climbing out difficult for any person or an animal who has fallen into the pool. Advise your insurer of your water feature. Protect against electrocution by means of placing electric wires inside a sealed water tight casing.